Windfall Jelly - Bear & Co.
Aeschylus meets Eastern Ontario in a new work by Eleanor Crowder, Windfall Jelly, at this year's Fringe Festival at Arts Court Theatre. Windfall. Fruit dropped by storm. Cored by coddling moth. Gored by wasp. When the Good Lord gives you windfalls, you make jelly. August is squash and zucchini and zinnias. Then it's apples and potatoes, no matter how hard the job of gleaning every drop. Directed by Eleanor Crowder, Windfall Jelly featured William Beddoe, Rachel Eugster, Emma Ferrante, Anna Lewis, Tim Oberholzer and Will Somers. Eleanor Crowder’s new show focuses on a marriage in trouble, and all the people revolving around it. They’re all connected to a pot of apple jelly one of the characters makes as the action happens, seemingly trying to recapture the family’s happiness through a recipe. Should you see it? When life gives you lemons, you make jelly in Eleanor Crowder’s Windfall Jelly. 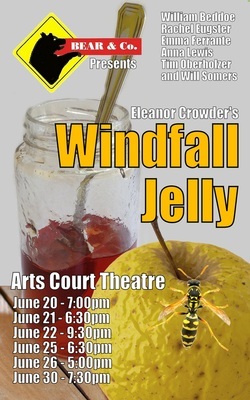 Jam-packed with dramatic rhetorical devices such as epizeuxes and metaphors about life lessons, Windfall Jelly is a performance that tells the story of a husband and wife whose marriage has hit a turbulent storm. This family drama, rooted in intergenerational conflict, a rotting marriage and the coming of winter, exerts an unexpected pull on the viewer. Eleanor directed Bear & Co.'s 'Tis Pity She's A Whore, at the Ottawa Fringe in 2012 and most recently directed their production of The Taming Of The Shrew. 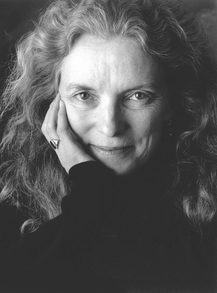 She appeared as twin Dukes in Bear & Co.'s As You Like It and appeared in, wrote and directed Momma's Boy. The bio: Belfast, Kingston, Calgary, Sudan, Ottawa, experimental theatre, physical theatre, nationalist voices, popular theatre, theatre in education, as many risky experiments as a young family will allow. Outaouais Popular Theatre, theatre in action. Salamander Theatre. Asterisk Rising. William has performed with many local companies including Odyssey Theatre, Third Wall, Evolution Theatre, The St. Lawrence Shakespeare Festival, Salamander Theatre for Young Audiences, and others. William was also part of the team of Producers who started the Ottawa Fringe Festival, and helped to guide it through its first two years. 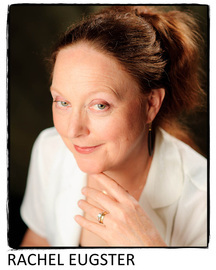 An actor and lyric soprano, Rachel Eugster is comfortable in a wide range of musical and theatrical genres. South of the border, she originated leads in a musical comedy adaptation of Jane Austen’s Persuasion, the Arthurian drama Avalon; and Conventional Behavior, a send-up of science fiction conventions. In Ottawa, Rachel has appeared in The Walk (Moon Dog Productions), in Momma’s Boy at the 2011 Fringe Festival, in the Gladstone’s Farndale Christmas Carol, and as soprano soloist with various choirs and orchestras. Rachel has served as music director for Salamander Shakespeare Co. and GNAG Theatre, and is an artist in residence at Parkdale United Church. Rachel recently appeared as Putana in Bear & Co.'s 'Tis Pity She's A Whore, where she also served as music director. Rachel was also music director for their production of As You Like It, and The Taming Of The Shrew. Rachel trained with Wayne Conner at the Peabody Conservatory (Master of Music, Applied Voice), and with Mary Burgess at Marlboro College (Honors BA, Music and Theater). She also holds an AFTRA Conservatory Certificate. Emma is a proud graduate of the St Lawrence College Music Theatre Performance Program, which she completed this April. Upon graduation, she moved to Toronto, where she will be playing Juliet’s Nurse in the Toronto Fringe Festival’s production of Surving Speares. She is thrilled to be back in the Ottawa theatre scene, and excited to be apart of her first Fringe show. Some Ottawa credits include, Yichud: Seclusion, and Don’t Blame the Bedouins, which appeared in the Magnetic North Theatre Festival. Recent credits include, Reverend Fred Phelps, Catherine Connolly/The Laramie Project, Maggie Jones/ 42nd Street, Mrs. Peachum/The Threepenny Opera, and Ms. Lynch/Grease. While at St. Lawrence, she also dabbled in directing, with her collective Next To Nothing Theatre, and Assistant Directed Nunsense: The Mega-Musical. 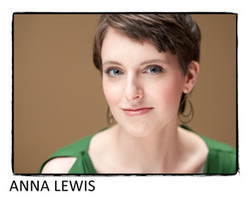 Anna Lewis is an Ottawa-based actor and creator with a BFA in Theatre from Concordia University. She has appeared most recently in Edmond and Tongue and Groove (Chamber Theatre Hintonburg), and Agnes of God (9th Hour). Last year at the Fringe, she played Annabella in Bear & Co.'s production of ‘Tis Pity She’s A Whore. Other credits include As You Like It, and Momma’s Boy (Bear & Co), A Midwinter’s Dream Tale (A Company of Fools), and How (Not) to Kill the King, a one-woman show produced at the Winnipeg Fringe. Film credits include Happy Suds and the title character in Brown Sound Underground with Nona Leslie. Catch her this summer directing The Comedy of Errors in parks around Ottawa. 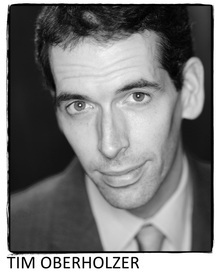 Tim Oberholzer is an Ottawa-based actor and graduate of Algonquin College's Theatre Arts Program. Tim has appeared locally in The Taming Of The Shrew, As You Like It and 'Tis Pity She's A Whore (Bear & Co.), Batboy: The Musical (Blacksheep Theatre), The Communication Cord, I Do Not Like Thee Dr. Fell and A Flea In Her Ear (Seventhirty Productions), Miracle on 34th Street: The Radio Show, Cyrano De Bergerac and The Shadow: A Christmas Mysteries Radio Show (Plosive Productions), The Radio Show: It's A Wonderful Life (Gladstone Productions), Othello (Salamander Shakespeare Co.), The Curse Of The Pekinese Peregrine, Showbiz is Murder and Murder in the First DeGlee (Eddie May Mysteries) and Tongue and Groove and Mechanicsville Monologues 2 (Chamber Theatre Hintonburg). He'll also debut his first created work, The Vanity Project at the 2013 Ottawa Fringe Festival. In July he can be seen in The Comedy of Errors (Bear & Co.) and in August in The Chronicler (Screaming Artist). He has been a core company artist with Salamander Theatre, Eastern Ontario's biggest English language theatre for young audiences, where he has appeared in plays, brought workshops into schools, and goofed around (artistically) at summer camps. He has also taught with OYP Theatre School, where he has written, directed, or written/directed better than an dozen plays and short films with students by the dozen for four years. Acting credits include, Touchstone in As You Like It, Bergetto/Cardinal in 'Tis Pity She's A Whore, Jordan in Momma's Boy, Romeo in Romeo & Juliet, The John and Collage Man in The Mechanicsvile Monologues series, and a lead role in Amanda Sage's short film Bliss. In contrast, Will's work as a director has taken him as far away from young audiences as you can imagine. In collaboration with Chamber Theatre Hintonburg, Will has directed Lee MacDougall's High Life, and staged Mamet's Sexual Perversity in Chicago in a bar. He also recently directed Bear & Co.'s As You Like It.